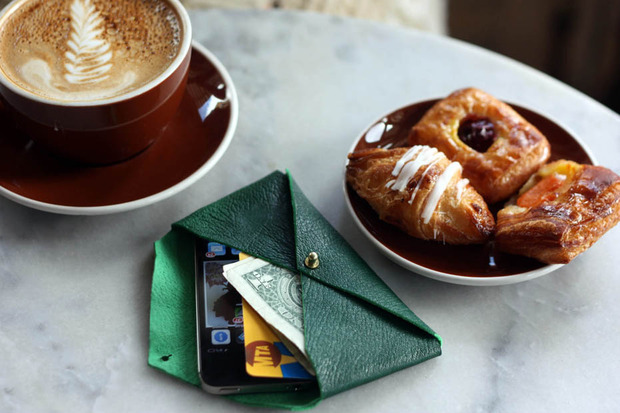 I always love a 'what's in my handbag' post on other peoples blogs, it connects with my nosy tendencies. I love to see what other people wear and how they live, so I thought it was about time I did my own. Just a little post about The Company Magazine #StyleBloggerAwards. The closing date for votes is this Saturday 4th of May! Here is a little reminder of how to vote for us. I saw this little beauty this week and thought I just had to share it as its so pretty. It's so simple and easy to do, but would make a really lovely present for someone, especially when you are going on holiday and don't want to carry around the big purse. There are lots of lovely projects on here too, so giving me some things to think about and try out. Just what to do first! Yesterday I shared my current favourite TV shows, one of which is Suits. 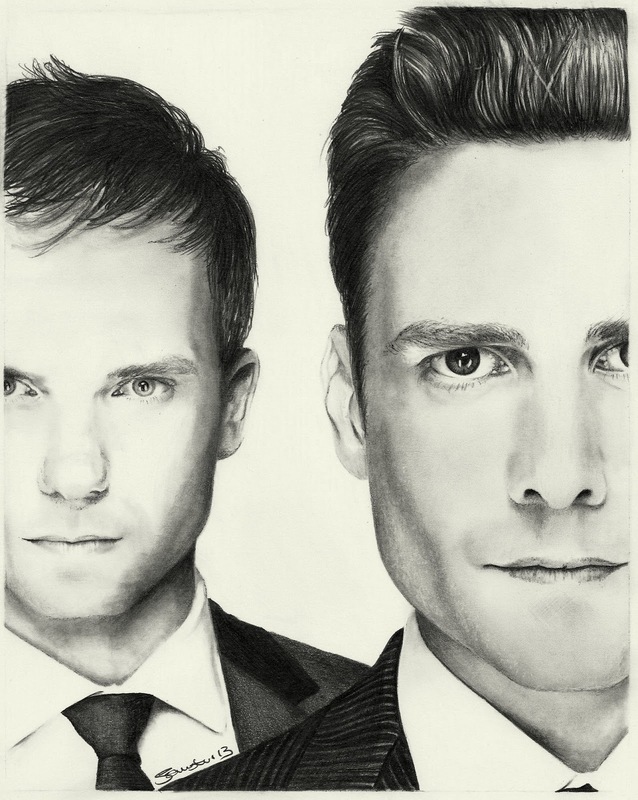 My posts about my drawings seem to be popular with you guys so I thought as we were on the subject I would share my latest drawing of the two stars of the show Patrick J Adams and Gabriel Macht. Some of you have asked about what materials and techniques I use for my drawings, so let me fill you in. I use a mechanical pencil, I have a few different ones but at the moment I'm using a Pentel twist-erase one because it has a nice rubber grip and I have 4B 0.5mm leads in it. I use a fine tipped rubber by Tombow Mono Zero which is really helpful to rub out really small areas and fine lines. For blending I use Derwent paper stumps. The paper I use is Bristol board, super smooth paper. Some people have asked how I get My drawings from the page to my computer, well I have a scanner. Most of my drawings are A4 or smaller so our HP printer/scanner is fine. I have to say it's really hard to get all the detail that I draw from the page to the screen, the scanner can never really pic up every line or the subtle shading in some areas, but I have managed to get the settings right for mine so they scan pretty well. There is no shortcut for this, it totally depends on your scanner settings and your computers settings too. It took me months of fiddling with settings to get it to the right ones for me, and my drawings. To get proportions right when I'm drawing I use a grid system, I usually print off two versions of my reference photo and draw a grid over one of them to get the facial features in the right place. I draw a corresponding grid on my blank paper and draw in the main features of the person I am drawing. When they are in lightly in pencil I rub out all of the grid lines and move on to using the second print out to start working on the details and shading. I would say I spend an averaged of 8-10 hours on a drawing over the space of three or four days, sometimes more, often I will start a drawing and then leave it for a few days, then go back to it. I draw for fun, It relaxes me, I draw for me and I don't sell my fan art drawings. What do you do that relaxes you? That thing that's just for you? I have admitted before that I am a TV addict, So I thought I would share my current top 6 shows that are always a series link must on my Sky planner. Aside from the fact that I have a tiny girl crush on Zooey Deschanel (who doesn't) this show is so funny, and I'm not even sure why. I just know that Schmidt (Max Greenfield) is the funnest douchbag ever, and Nick (Jake Johnson) is hot, in that weird 'I shouldn't fancy him but I do' way. Clever plot twists and a cast of rich hot guys ( Nick Wechsler, Joshua Bowman, Barry Sloane ) , what could be better. The theme tune alone should be hailed as genius! 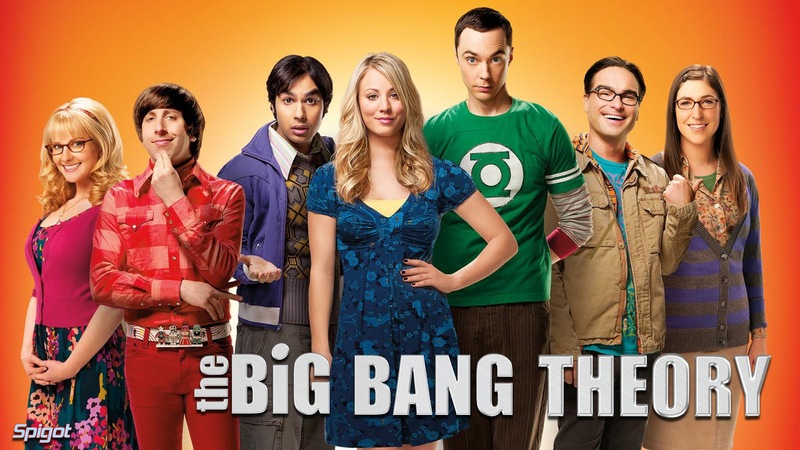 You cant help but fall in love with this show, funny, clever and jam packed with geekary! 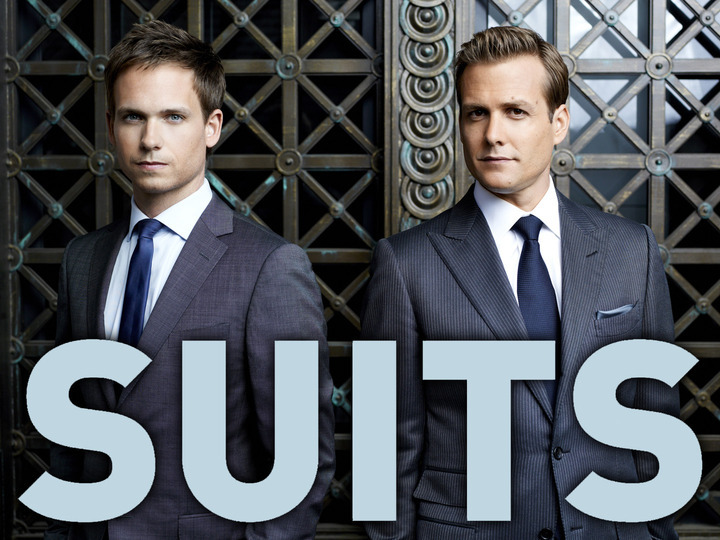 Brilliant show, their is a great chemistry between Harvey Specter (Gabriel Macht) top New York Attorney and his associate Mike Ross (Patrick J Adams), and again a great supporting cast. 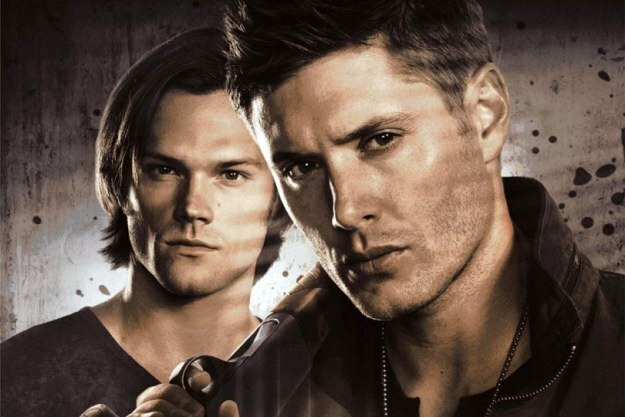 This list would not be complete without Supernatural, I am totally in love with this show, since the beginning the Winchester brothers, Sam (Jared Padalecki) and Dean (Jensen Ackles) stole my heart! With a band of fans that fight tooth and nail to keep this show on our airwaves, even if we have to wait months in the UK to see the latest series, its totally worth every minuet. If I where to include all the UK shows I love too we would be here all day! As Sammy showed you her Wish List on Tuesday, its now my turn. I am a Spring and Autumn kind of girl and so this is my favourite time of year to get some new items in my wardrobe! As you can see there is a very colourful theme running through my choices and as a previous 'black only' girl I am going all out with colour! Not all at once though! Lots to keep me going through the changeable weather we no doubt will be having this Spring. As the warmer weather seems to be finally on its way here in the UK, H and I have been raiding our wardrobes to work out what we want to wear this spring now that its too warm for our favoured coloured jeans and chunky jumpers combo. 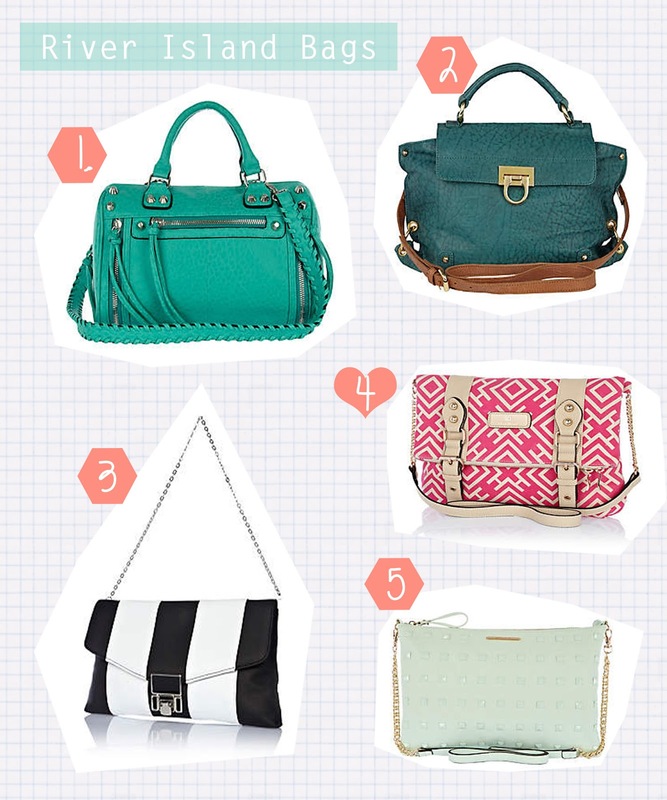 Here's what's on my spring wish list. 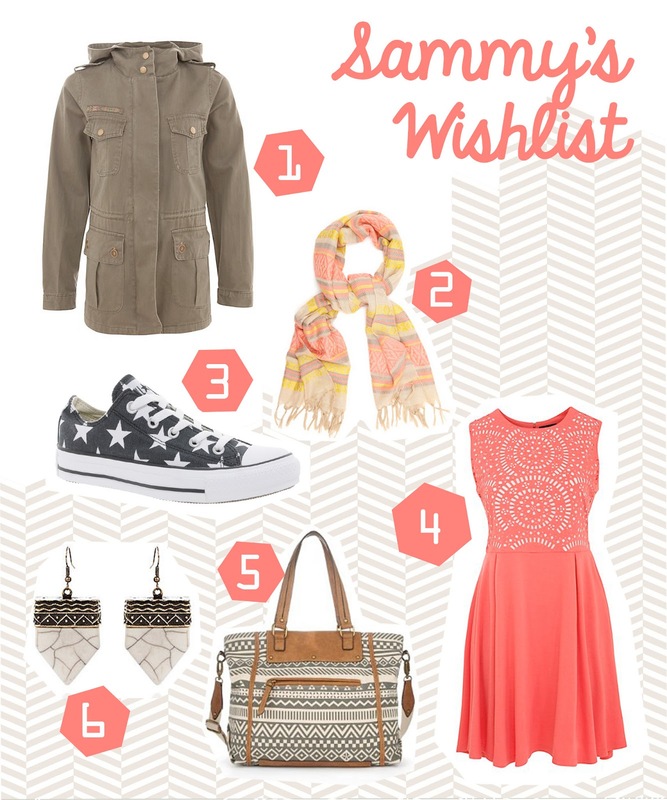 I am Loving Khaki and Coral at the moment, Neon, Aztec and anything cut-work. There is always room for a new pair of converse in my wardrobe, especially star printed ones. I may just have a go at DIYing my own version of those. This Thursday (25th April ) is our Embroidery Workshop down at Norden Farm, Maidenhead - yey exciting. We have loved doing these workshops and showing our participants some new skills and hope they have enjoyed our ramblings just as much! There are still a few spaces left to take part and take home some of your own work and you can book online here. You will learn lots of different embroidery techniques during the workshop and get to see some of the work we have done - everyone likes a bit of a nosey hey! You will then be able to put all the stitches together to make something pretty to take away with you. If you can't make this one, not to worry, we will have some further workshops in May and June down at Norden farm and we will let you have the links to book as soon as they are up on their website. If there is anyone who comes to Norden Farm and has any ideas of anything they fancy making, please let us know and we can see if we can make it happen. Just leave us a comment below or on our facebook page. 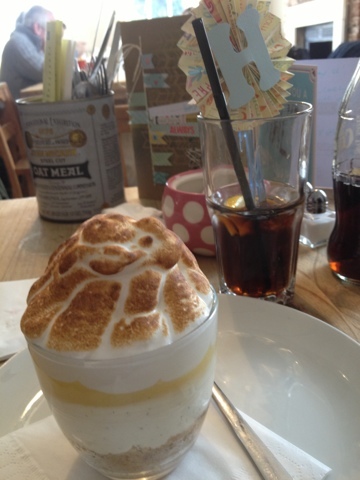 Ok, so most of the time I am led by my stomach and so although I try to be good, I can mostly be found staring at cakes! - luckily my niece takes after me, so I will have a permanent cake partner! This recipe caught my eye as I love brownies, but mostly when I go to buy them in shops they have nuts in - not allergic, just don't like them. I know its confusing but it does amaze me how many cakes have nuts in these days considering there are so many nut allergy sufferers out there. This not liking nuts basically means I don't end up getting something I want - annyoing - which then makes me want something more! I blame it on that anyway. So for this week I thought I would link the recipe for beginner after dinner mint brownies, as they look sooooooooooo good. I want to make them for someone's birthday I think! or maybe just for myself. The website its from is pretty cool too - Domestic Sluttery - and has loads of foodie and fashion tips to check out. That's when you have stopped looking at ours and of course not forgetting to vote for us in the company style blogger awards! Unless you have been hiding under a rock for the past year, there is no doubt that you will have come across the craft worlds new lover, Washi tape. All the way from the place that is always willing to offer up the cutest crafting stationary, Japan, it has taken our hearts and refuses to let go. I, with my love of all things cute and stationary related of course have a few (read lots) in my crafting collection. Another brand of the moment is Essie nail polish (another thing I have a 'collection' of) Their cute colours and embossed bottles can be seen all over Istagram daily. Sitting at my desk last week I came across a fun way to combine the two! I taped the lids of my polishes with co-coordinating colours, I have to admit that I did have to pop a little extra glue on the overlap to stop the tape from pealing back, but don't they look even cuter than before!! Couldn't resist sharing a few shots of my Washi tape collection too. 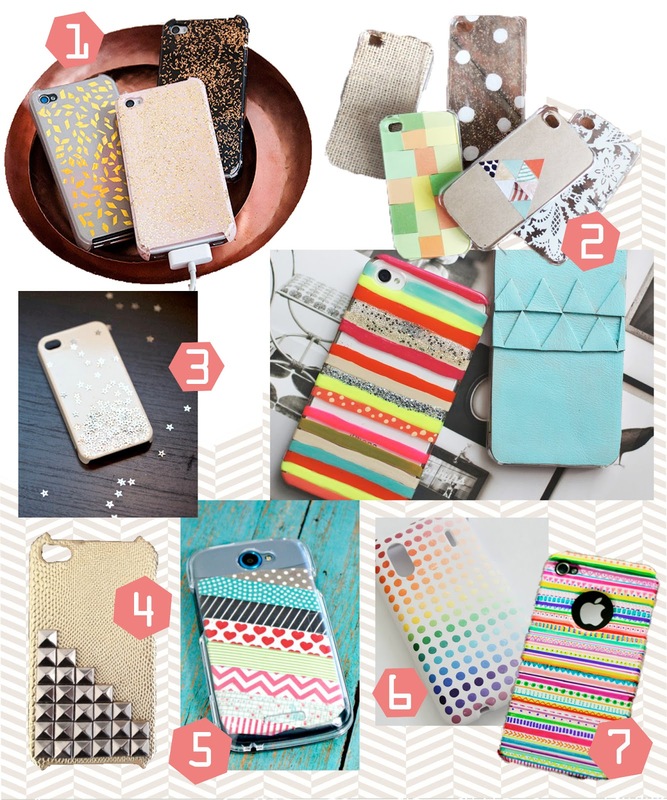 Do you love Washi? What do you do with yours?? oh and whats your favourtie brand/shade of nail polish? I know H loves Nails Inc in any shade of blue obviously! I love changing up my phone case don't you, it's a fun way to make your tech you own, to personalise it without damaging it. There are so many diy versions out there that you could make a different cse for every day of the week! 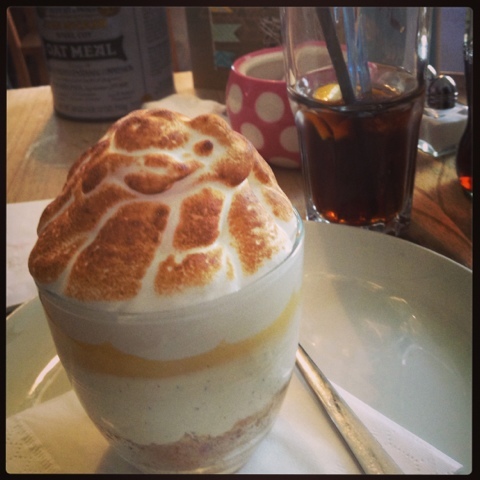 Here is a round up of some of my favourites. Some really cool ideas don't you think? I am off to find my Sharpies! 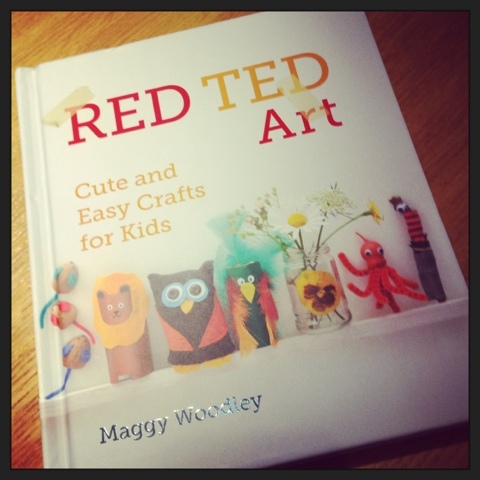 Last week I won the Red Ted Art Book by Maggy Woodley from a competition on a blog we follow called Minieco. I'm a sucker for a competition and haven't won anything before, so it was a lovely surprise and a great book for planning some more activities for my work at The Lightbox. 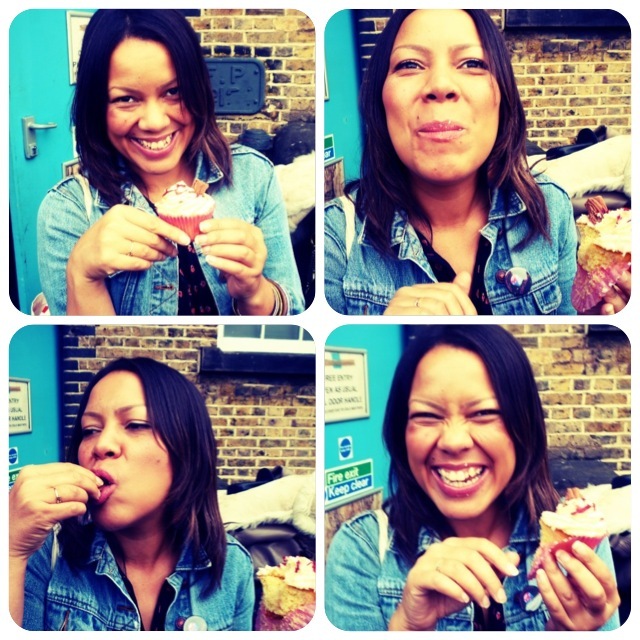 This month's Who's who comes from Zoe at Craft Candy, you may remember last month we went to the launch party for the app and had a great time, so here is more about Zoe and what Craft Candy are all about. I'm Zoe, 9-5er by day and crafter and Craft Candy founder by night. 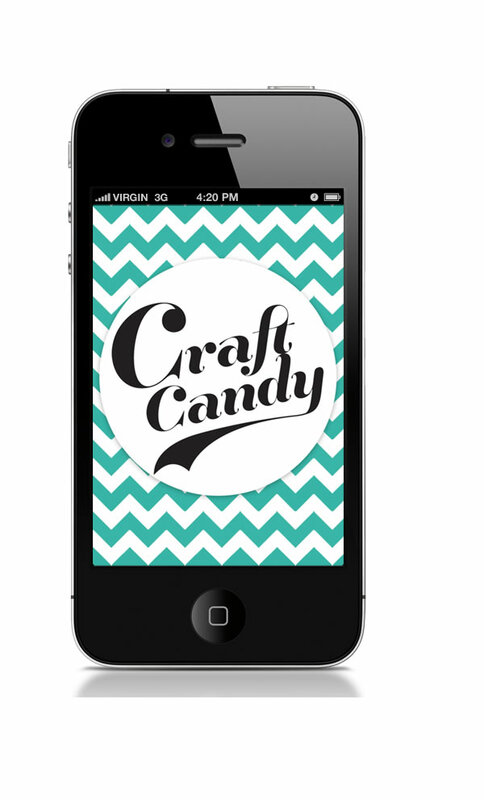 I'm the founder of Craft Candy, the UK's first craft events listing website and App for the iPhone & Android. Craft Candy is all about community, so we've developed a craft events App which is free to download, the App is fitted with GPS listing local craft events in mile radius from where the user is standing. Craft Candy lists craft workshops, markets and clubs but what makes us just a little special are our creative Advertising packages. Each package includes social media, i.e. tweets, posts or pins depending on the package, to help to spread the event details further than our website & App. Unlike other sites if you have a free event, i.e. 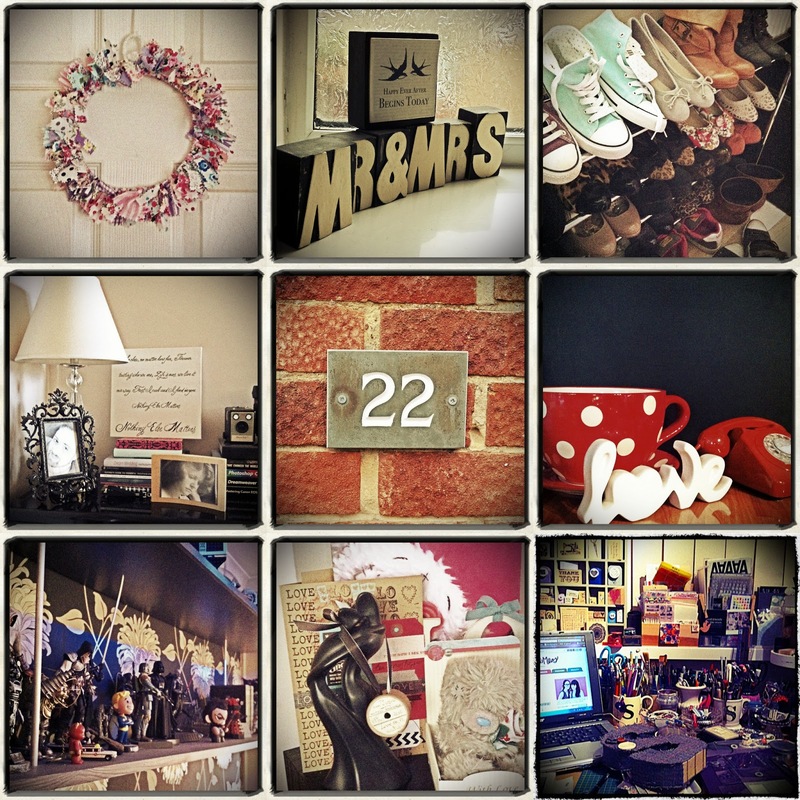 craft market, knitting group or meet-up etc. you can list your event for free on Craft Candy, just upload the event details to the website and it also appear on the App. I come from a crafting and making background and I understand the margins for making are tight, so I created monthly pay-as-you go advertising options to ensure companies aren't tied into a contract and starting from £10 even the smallest budget can list their workshop on CraftCandy. I started as a blogger, blogging about local craft markets and workshops and over 18 months my blog grew and grew and it turns out I wasn't the only person looking for local things to make and do. Eventually I decided to take the plunge, researched the market, or multiple markets, craft, social media and the smartphone App market, (I'm not technical so it wasn't a quick process) to see how feasible my Craft Candy business idea was. Obviously I thought my idea was amazing, but being a start-up in a market which has seen limited marketing investment unlike fashion, car or technology industries and talking to people about my business idea who have never crafted before and just associated craft with old women was depressing and in the end I gave up talking to potential business partners or investors and I decided to go it alone and so I started saving. Eventually my partner Chris kind of took pity on me and told me he would consider investing if I completed a survey of businesses in the market, I did, the findings were great and now I have a business partner. To grow Craft Candy across the UK, very early on, we dipped our toe by launching Craft Candy in London, but three weeks ago we opened it up to the rest of UK, the GPS in the App will now work anywhere where there is a craft event in England (which has been uploaded to our site). The App launched on the 10th March and we intend for it to be a beta App, which means whist you are using it, we are keen to gather your feedback & comments to help to refine it, Good or bad we don't mind, we just want to improve its functions. Finally, we need to grow our Shop Directory, once our users have learnt or developed a skill, they need supplies to do it in their own time, but where do they buy supplies? Eventually our Shop Directory will have a comprehensive list of retailers to pick from. This is a great question, I hate regretting mistakes, but I love to learn from them, preferably other people’s mistakes rather than my own, but there have been a couple along the way. If I could go back and whisper advice in my ear it would be to get references when engaging with a company or freelancer to do work and to simply be patient. Patience is a virtue as they say, but we at Live it. Love it. Make it. never have enough of it! Craft Candy is such a great resource and so you should definitely check it out to put workshops on there or to find workshops in your area or perhaps if your spending a few days somewhere for work or whatever, you could see what is in the local area for you to check out! We Love it. I always have a few sewing projects in my 'to do' pile. 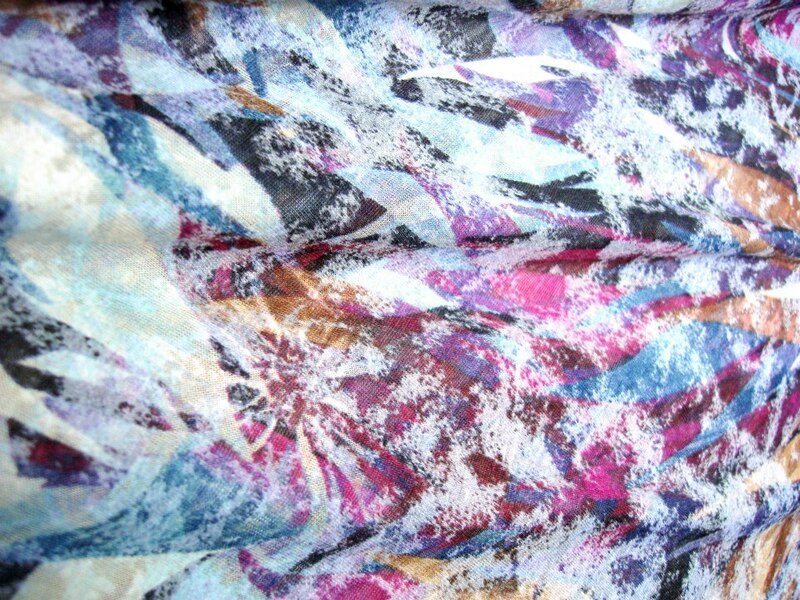 When I choose new fabrics at Sew Crafty I take pictures of the samples on my phone and whilst we wait for the order to arrive I pick out my favourites and choose patterns right away. In reality they don't always make it any further than my note book. This season I am determined to get some making done, I thought if I posted them here it might help me to commit some time to making them reality. 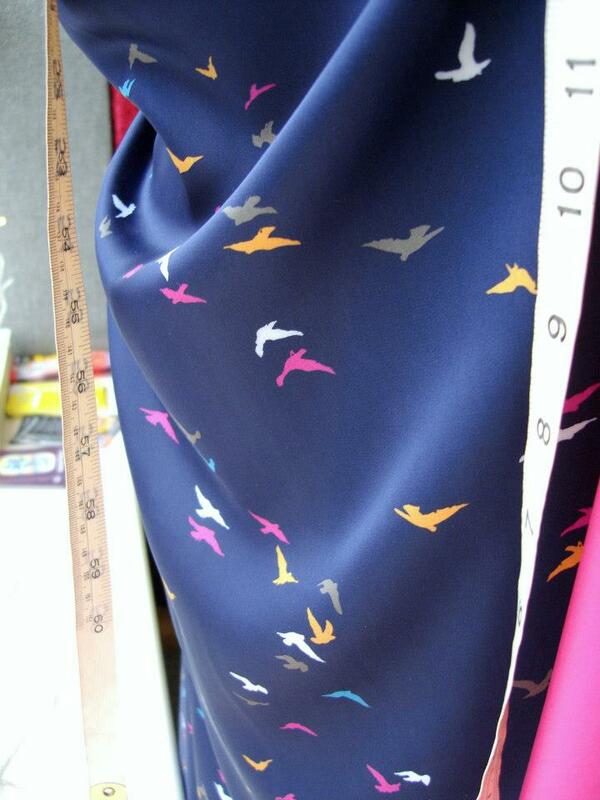 This bird fabric was a winner for me as soon as I saw it in the sample pile. It's a super soft matt satin and the colours are lush! 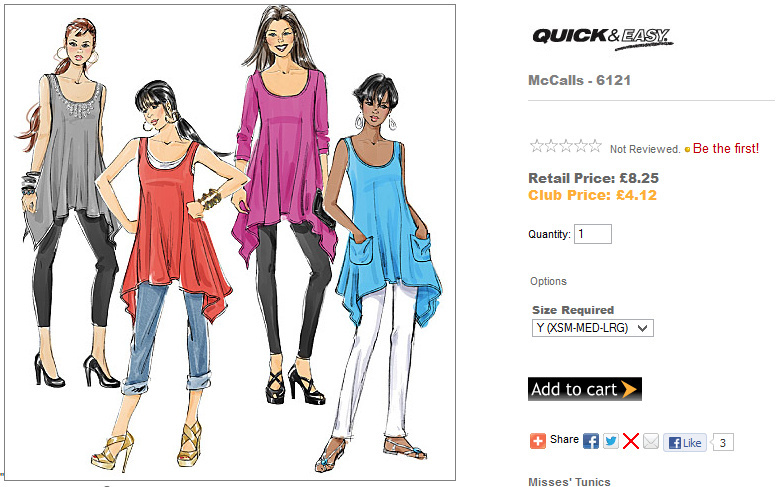 I have chosen this McCalls patten to make it up as I love this soft relaxed style, it means I can wear it at work too. I am really looking forward to picking out the colours to do some little details like stitching and binding. 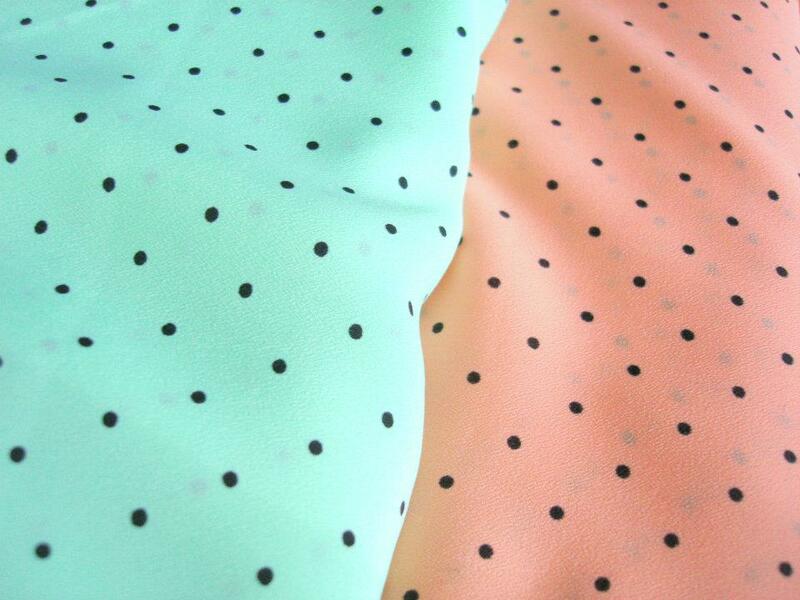 We have had this dot fabric in for a while but it took me a while to work out which pattern I was going to use. I have chosen the mint green to make up, I am loving this colour at the moment. I am hoping this pattern will make a good match for the dot Georgette, it has a really gathered skirt, and the rouching around the bodice should be lovely with this shear fabric. I really like that although it looks like a wrap-over dress it has that modesty panel in the front, I have a bigger bust so it means it will be more flattering... hopefully. 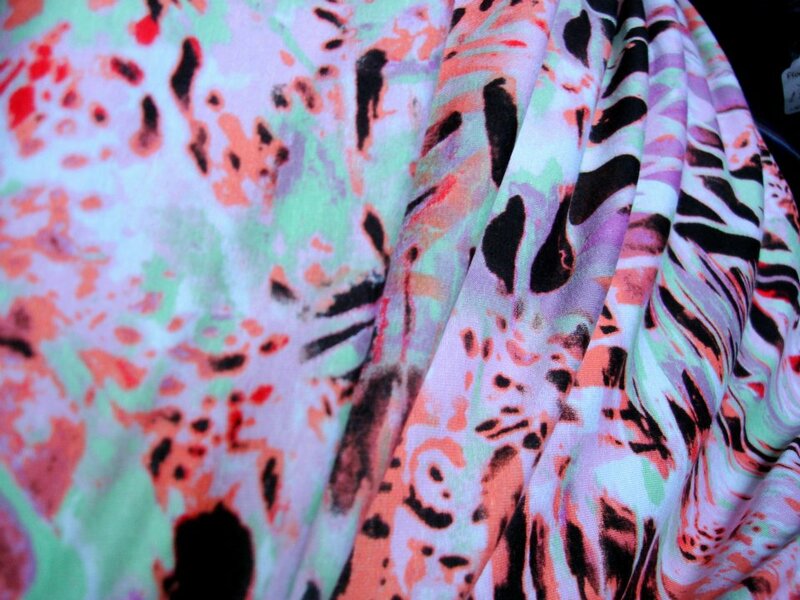 This fabric was another instant love for me, all the colours make it really versatile. It is a burnout jersey and it's sooooo soft. 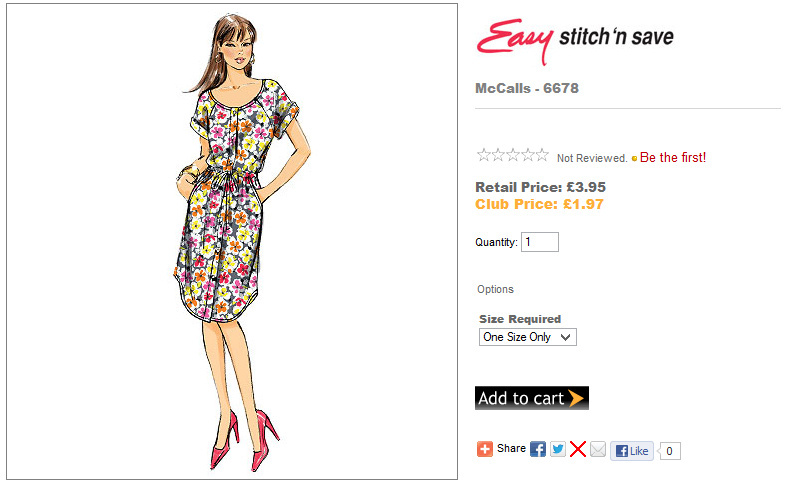 I chose a versatile pattern, quite similar in shape to a few tops I already own so I know I will like it. So, like I said I chose a pattern similar to tops I have already, I love these swing type tops, they are so easy to throw on in the mornings for work, you can keep them casual or dress them up with some jewellery. Another instant favourite of mine due to the awesome colours, Neon anyone? Yes Please! I love how they have mixed the neon colours with the pastel lilac and mint green. Another soft jersey, so the only choice for me for a pattern was a summery Maxi dress. 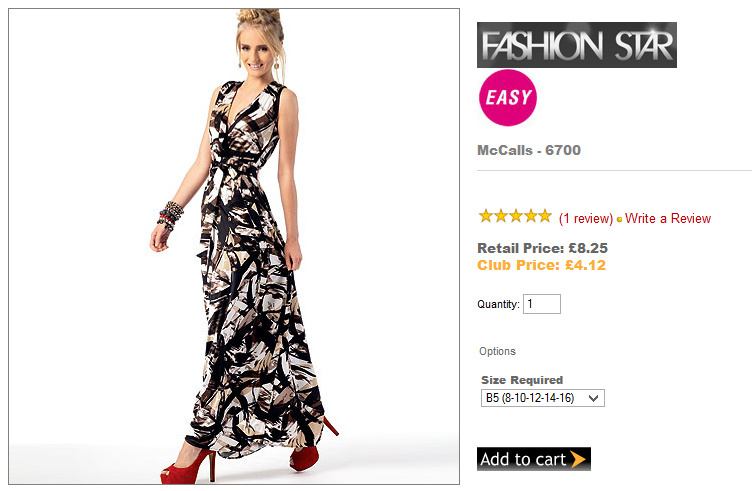 Again being larger in the bust department, means that strapless maxis are a no no for me and although I am a shorty at 5'4'' I still find it hard to get maxi dresses that are as long as I like them, i.e. practically dragging on the floor, so I love it when I find a fabric to make my own because I can make it as long as I like! I can't promise step-by-step updates but I will post some pics here when I have made up theses beauties. The Bird fabric is cut out and ready to be started, so that will hopefully be ready soon. One of my New Years resolutions was to take more time for myself and Sewing is one of those things that often got pushed to one side because of house work or errands, not any more! I am setting aside two nights a week to do specifically sewing projects. 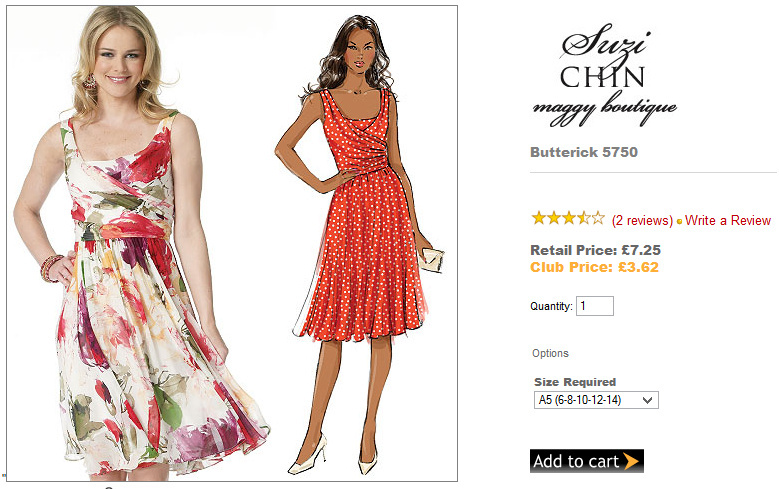 One for dress making and one for craft sewing. So hopefully there will be a few more post about things I have made around here soon. Do you have a list of projects to do? or a list of unfinished projects? what would it take for you to tick a few of those projects off? how good would that feel! This week I thought that due to all the buzz that has surrounded sewing in the past few weeks it might be useful to give a sewing link- some TV show called The Sewing Bee might have something to do with it. Also, they put all the links up for all the projects and fabric/haberdashery suppliers for The Sewing Bee show. So if you really want that spotty fabric for the blouse from the last episode or the car print cotton from episode one then this is the place to find all the information you need. 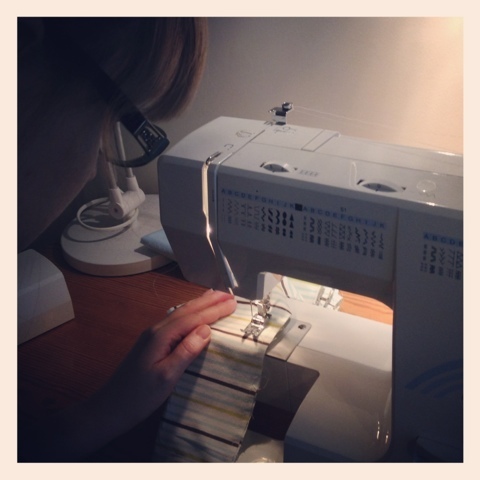 And yes that is me in the picture working hard on my sewing machine! I even had my glasses on so you can tell it was serious! 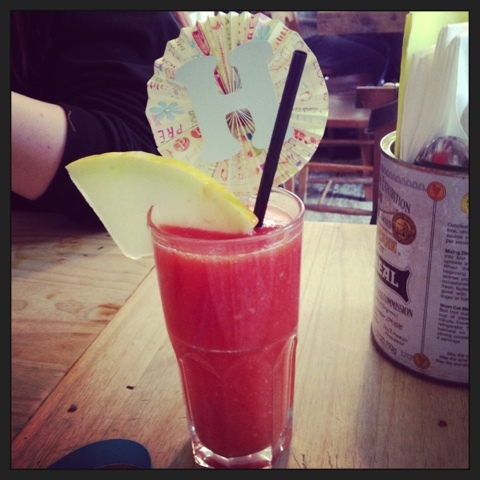 If you haven't already voted for us, Pretty please pop over and cast your vote now. We are up for Best Blogging Duo and Best Craft Blog. If you have voted, Thank you so much and keep your fingers crossed for us! I love feathers, I work with them a lot at the Sew Crafty when I am making and adapting fascinators and hats. I love feather print fabric too, I bought this jumper from M&S last week and last summer I made some feather earrings to sell in the Craft Coop Pop up shop in Maidenhead. 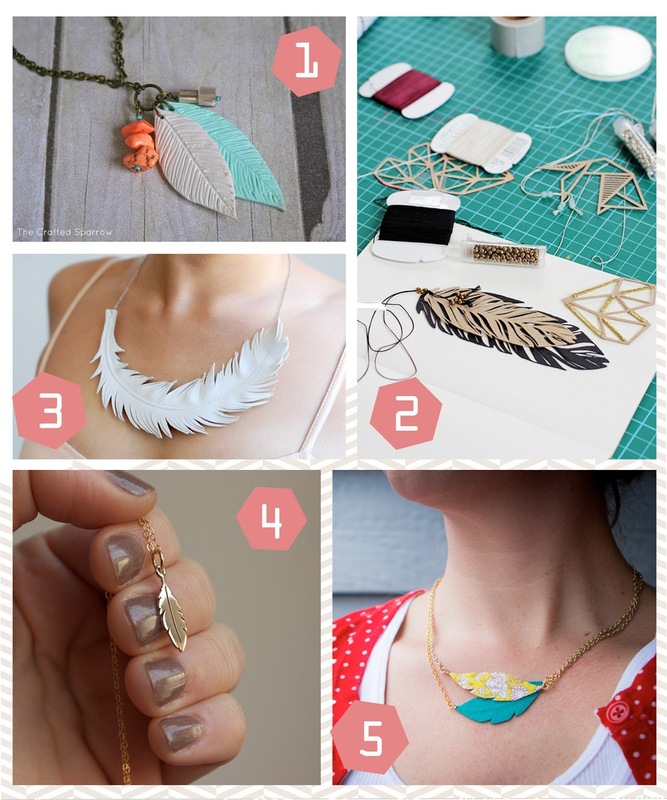 As much as I like real feathers, I love these alternatives I have found around the web. These are all necklaces made with anything but real feathers. I really love the fabric feathers, follow the link for a tutorial on that one, I am having a go at that today! What are you up to this weekend? Lots of crafting planned?? I love the theatre! I love the actors (most of the time), I love the scene changes and the puppets, I love the clever songs in the muscials and the suspense in the plays. I also love the buildings that house the theatre's, especially in London. 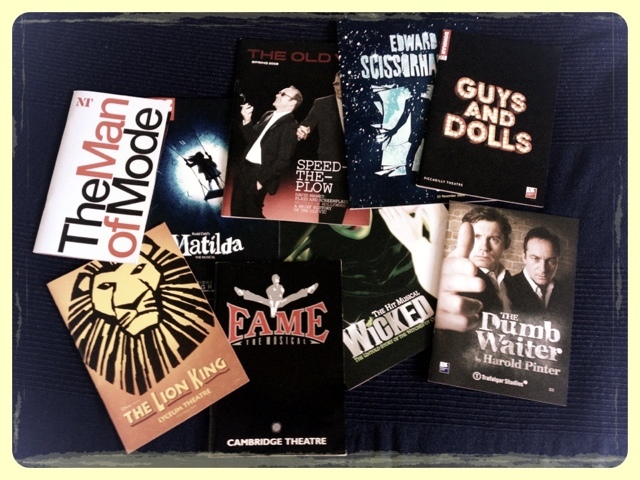 We have some of the oldest theatres in the world and some of the best shows here in the UK, so what's not to love! I do love a musical and although many people would tell you that I am not really into cheesy things, there is something about a clever musical and big belter of a song that entices me. I used to work in a theatre over in Reading called The Hexagon and although we didn't produce shows themselves it was amazing to see the back of house and learn more about what goes on. The downside is that now I can't just enjoy a show without thinking what the staff have to get up to, but I do give it a good go! The Lion King and Matilda I think are my two favourite Musicals of all time (at the moment) as the set movements and actors are so great. Part of what is good also is that there are no 'famous' people in it and so all the attention goes to the brilliant theatre actors we have in this country in their own right. The Lion King has the most amazing large scale puppets and if you ever go to see it, make sure you don't miss the beginning. It follows the same story as the film, but its such a spectacle that it doesn't matter that you know what happens. Matilda is so clever its hard to explain, the songs have been done by Tim Minchen and to find out more, check out my blog post here. Fame, I think was my first every musical and I have seen it a few times since, the original and more modern versions. The original is always the best though - and that includes the film. After seeing this I wanted to be a dancer, but soon realised it was not for me. Wicked was great and a first for me of a show that came from America after it was so popular there. I challenge anyone not to sing along to 'Defying Gravity'. Elphaba has to spend the whole show with green make-up all over her and so I applaud her for that alone, but all the acting was great too. The Dumb Waiter, I just had to go and see as I love Lee Evans and really wanted to see him in a dramatic play, rather than always playing the funny man. This was my first Harold Pinter play and it didn't dissapoint, the pull for me was Lee Evans and he was great playing a dramatic part, but Jason Isaacs was great too and they were both on stage all the time and never missed a beat on the very tiny stage at Trafalgar Studios. Guys and Dolls is a typical Musical really, but one that had great Dance sequences. I love a good group dance piece and it was constant throughout with lots going on and lively music. I dreamt again of being a dancer, but alas by my 20's I think my time had passed - plus I have no co-ordination between brain and body parts when trying to learn a sequence! Edward Scissorhands at Sadlers Wells was my first Ballet and it was adapted by Matthew Bourne, so if your going to see ballet, I guess he is the best to see. It was a lovely show and as I knew the story it was an easy one for me to follow. Great for my first try of Ballet. Speed the Plow starred Kevin Spacey and Jeff Goldblum, both amazing actors and as Kevin was Artitsic Director at The old Vic at the time, I guess he had to do something amazing! 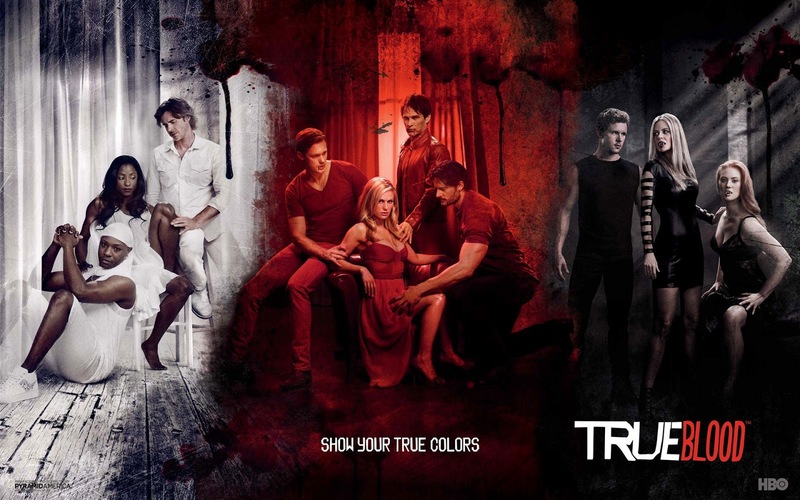 It was a brilliant show with great actors and so good to see how they work off-screen and with no out-takes. The Man of Mode was one of the shows that I went to when I used to live in London and go down to the National Theatre for the cheap tickets through Travelex. I love all the different stages at the National and everytime I have been, I have tried to get into a different theatre so that I can see them all. I have seen Shakespeare and many other plays here too so there is a wide range and when you get cheap tickets it can't be bad hey! You can even go on a backstage tour to see all the different stages and the Theatre as a whole, which is well worth seeing. 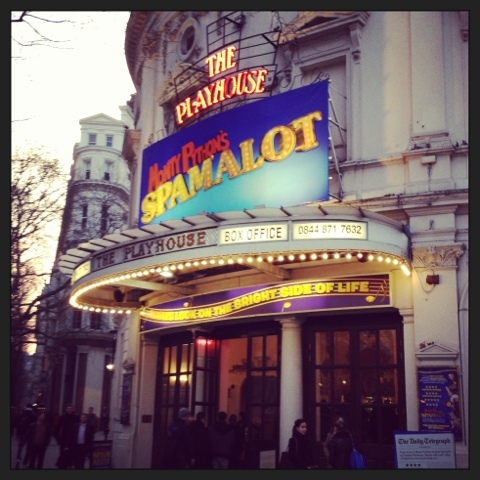 Also, this week I went to see Spamalot with my parents for my Birthday treat and as the family are Monty Python fans it would seem rude not to go and see it. The show was very funny and had some of the classic Monty Python sketches in it - 'the knights who say nie' for example. They had plenty of songs that were new and pulled the whole thing together and so there were plenty of laughs to be had. So what's next? I have still yet to see Phantom or Les Mis and so they are on my list, also I want to see War Horse, but to be honest I will go and see most things as I just love the theatre, plus the Ice cream at half time! Let me know what's your favourite in the comments below and I can add it to my list. This months creative space comes from Jenny from Boogaloo studios who has done some amazing needle felting most recently which caught H's eye. Needle felting has been hard for us to love, but Jenny makes it look so easy and she does such cute creatures. 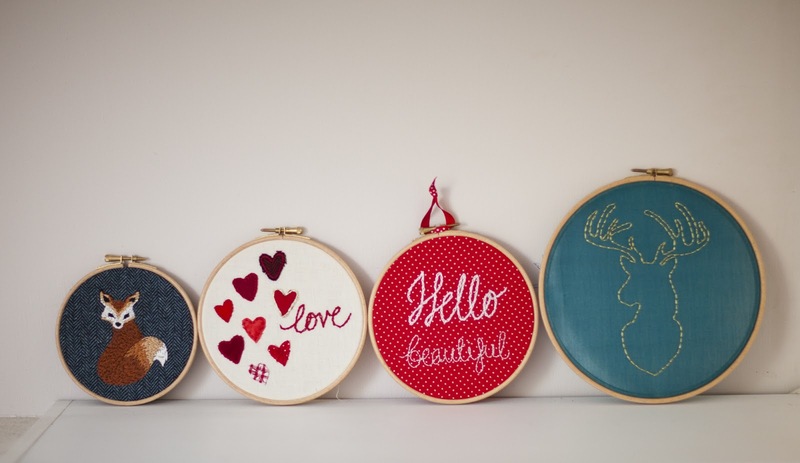 She is planning to use her embroidery as inspiration which we think is a great idea! My creative space is in the guest bedroom of my condo. I paint, cut, stitch, felt....pretty much anything and everything crafty you can think of. I absolutely love my craft space. I love that it's in a separate room rather than out in the open. I can close the door and have some privacy if I wanted to. 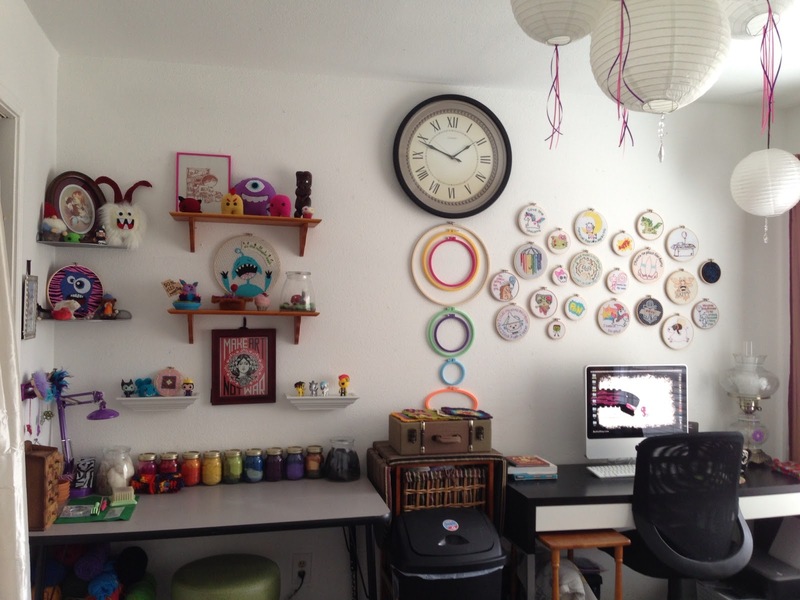 Jenny's space is very inspirational and pretty so thanks go to her for sharing with us. I was watching a TV show last week which was talking about the resurgence of the non-digital camera. It seems with all this digital technology some of us are preferring to go old school and taking lots of photos and then seeing what comes out! 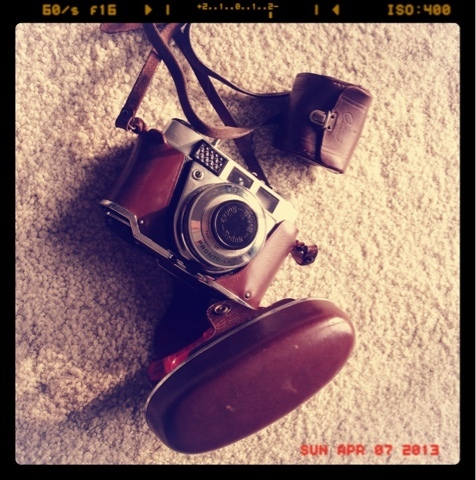 I love Vintage cameras and the photo at the top is my Dad's old camera which I saved from one of my parents purging sessions. I do need to find out if it still works though. I love the idea that you cannot manipulate the image and perhaps you may take more care in getting the right shot - not so good for those moving children shots though I bet! There was also an article in the new Crafty Magazine where Stephanie de Geus shared her tips for picking up old cameras and her love of using film rather than digital. So this week's link gives you a bit more advice on choosing Vintage cameras and what film to use. There are also all the vintage looking cameras that are coming back into style if you don't fancy trying to find a camera that works in your attic. Out of these options I really fancy the Lomography Diana camera and a fish eye lens.... and it comes in blue! fantastic. So, today was my birthday and so I thought I would share with you just how today has unfolded, it went very food orientated - just how birthdays should be! First, it started with cake! 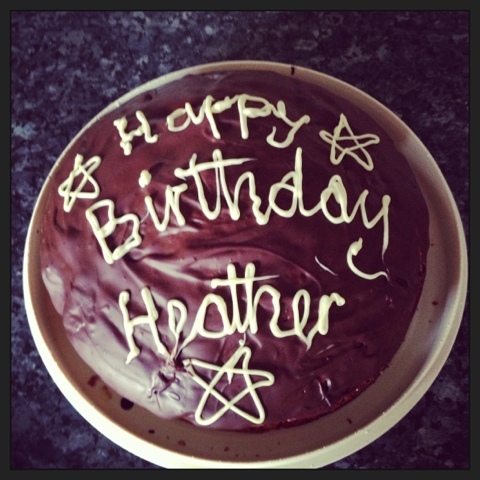 My mum does like to make a cake and has been baking my cakes for years! I seem to remember all sorts of shapes and styles of cake growing up and just because I am now in my thirties, I still get a cake! It was Lemon cake with Chocolate icing, mmmmmmmm. Then I met up with Sammy and Anna at Bill's in Reading, for some food and I got this lovely Mango, Passionfruit and Strawberry juice with my chicken skewers meal - sorry totally forgot to photograph that! They have Bill's restaurants all over the place and so you should definitely check them out, the food is lovely and the puddings are really really good! After a spot of shopping to walk a bit of it off, I am spending the evening in a food coma - well maybe just one more bit of cake! My favourite place to buy bags is by far, the rock chic of the high street, River Island. With all the horrible weather we have been having recently, I have been inclined to stay indoors and make a few treats to keep myself going through all the crafting/blogging. I found these simple to make biscuits and they can be made with store cupboard bits without even having to leave the house for extra ingredients. 2. Add the butter and sugar in a bowl and mix until light and fluffy. 3. Add the vanilla, mix, then add the flour and mix well. 4. Roll out to about 5mm and cut into shapes or if like me, life is just too short, make small balls out of the mixture and push down on a baking sheet to about 5mm thick. 5. Then pop them into the oven for about 25 minutes or until golden brown. Then voila, done. Just wait for them to cool and you have some simple biscuits. You could add chocolate drops or nuts if you would like something a bit extra, just add them in at the mixing stage. Unfortunately they get eaten far too quickly with me, but as they are so easy to make, I can always make another batch hey! What's your favourite quick bake? let me know in the comments below.